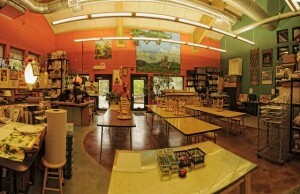 Art is an integral part of the Montessori curriculum. Children have opportunity throughout the day to experience the beauty of their classrooms which are filled with sculptures, paintings, artifacts and crafted wooden materials and furnishings. 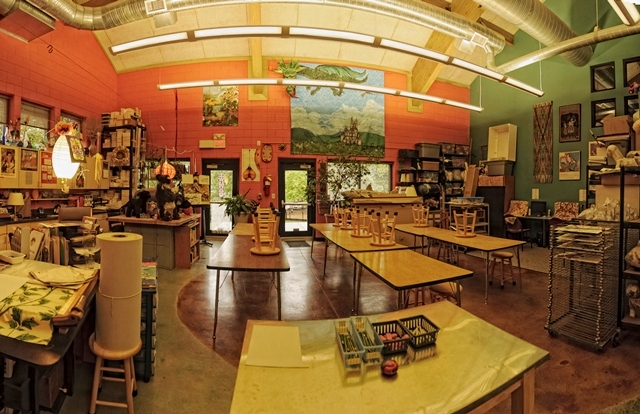 Each classroom has a designated art area which encourages the children to explore painting, drawing, and handcrafts. In art class students are introduced to two dimensional and three dimensional design principals. They begin by drawing a three dimensional still life in a two dimensional picture plane. This provides an opportunity to learn spatial concepts such as overlapping to make objects appear further back in space. Young art students learn the color wheel and practice mixing and blending colors. Art lessons focus on creative process with guidance when necessary. Students learn how to neutralize color by adding its compliment. By tinting and shading a child gives their work contrast and variety. Students also explore the effective use of color and color schemes. Art vocabulary introduces elementary concepts and movements in art. Students learn verbal skills while discussing and critiquing their work. Art helps develop aesthetics pedagogically with experiential knowledge as a form of self expression. Working in a variety of materials, lessons will focus on beauty and students will be encouraged to look for ways to express harmony. With clay students do both hand-building of figures and wheel throwing vessel forms. Clay has a way of teaching and students see and feel when a work is complete. As part of our integrated curriculum art is presented within the cultural lessons. Artists and schools of art are explored as they relate to time lines and the needs of man. Additionally children have many opportunities to work on maps, story books, geometric designs and other classroom projects which brings out their artistic expression.